Zombies, Run! 2.2 receives HUGE Living Base update! – Zombies, Run! Zombies, Run! 2.2 receives HUGE Living Base update! Even though the paint isn’t even dry yet on ZombieLink Social, we have a lot more exciting Zombies, Run! updates for both iOS and Android users that we just can’t wait to show you. This new update to the app, which is available right now, is the biggest update we’ve released since the game was launched in April. 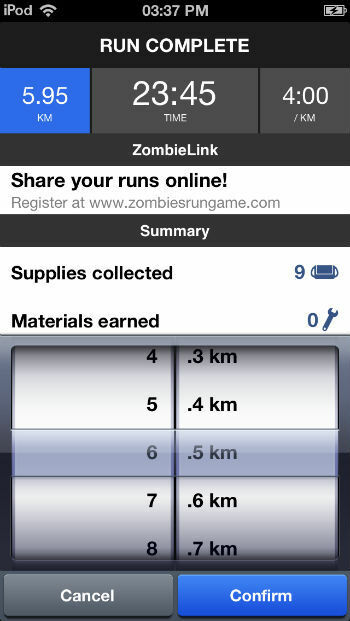 Read on to find out how we’ve made the Zombies, Run! experience even better! You have probably been wondering what those numbers at the top of the Zombies, Run! base screen mean. They’re your defence and morale ratings and you’re suddenly going to be paying them a lot more attention than you had before. That’s because we’ve just given Abel Township a shot of adrenaline and upgraded it to what we call a “living base”. Players will receive gifts from people inside and outside of your base, giving you a small boost in supplies. 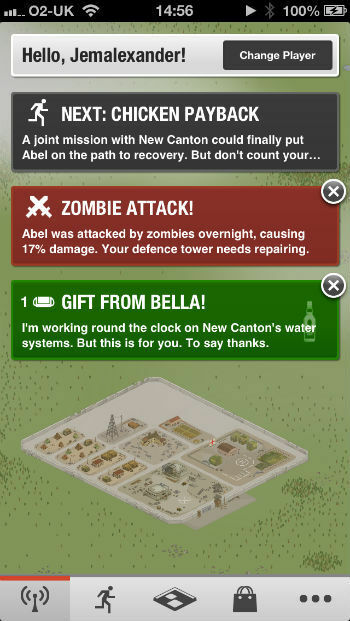 However, Abel is also now under threat of zombie attack, so you may find that the undead have taken a bite out of your defence tower. 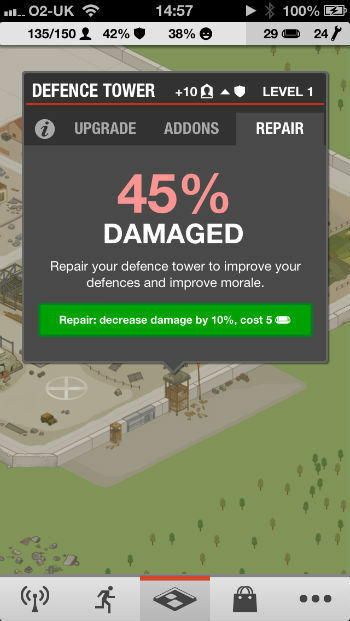 Fixing this up will require spending a few supplies, so you’ll need to keep running to keep the people of Abel safe. The Zombies, Run! news feed will alert you whenever these things take place, so check the app every morning to stay up to date with the comings and goings of your base. 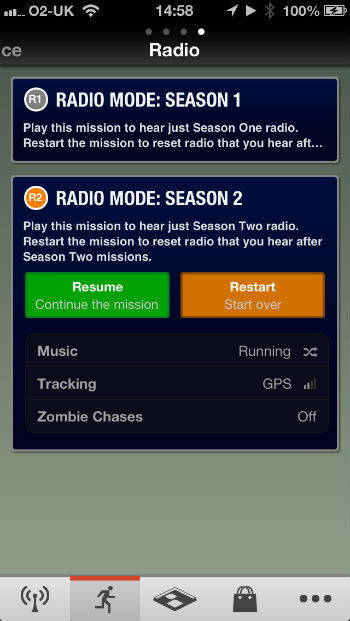 Alongside the Living Base, we’ve also brought Radio Mode back to Zombies, Run! on iPhone and iPod Touch (Android users have had Radio Mode since April 26th). We think you’ll be pretty pleased with the way we’ve implemented it, too. You can pick between starting your latest run by listening to either Season 1 radio mode (all Jack and Eugene, all the time) or Season 2 radio mode (Phil and Zoe). And if you manage to get to the end, simply hit “Restart mission” and you can start over from the beginning again. But you won’t be running out of content any time soon, because we’ve just added a huge batch of new Radio dialogue. Jack and Eugene are back! Not only that, but we’ve been adding some context sensitive audio clips. So depending on the state of your base, or the happiness of the Township inhabitants, you may hear different snippets of dialogue. Keep an ear out for special clips that play only on certain days, too. This update also includes a bunch of little tweaks and fixes for the iOS version, such as the ability to jump to the next unplayed mission straight from the app’s news screen. We’ve also expanded the distance estimation feature from the Race Missions so that they can be used in any mission. You’ll be able to choose a constant speed, as well as inputting your stride length so that, even without GPS, you’ll have a good idea of how far you’ve run. If you’re using a treadmill, chances are you’ll already know how far you have run. So we’ve allowed you to input this distance into the app once the mission ends. Just click on the distance on the Mission End screen and you’ll be able to update the value manually. And, finally, you will now be told which buildings and upgrades you can now afford whenever you finish a mission. Check out the App Store and Google Play Store for the full change logs for each version. Previous Post How awesome is your base? Prove it.